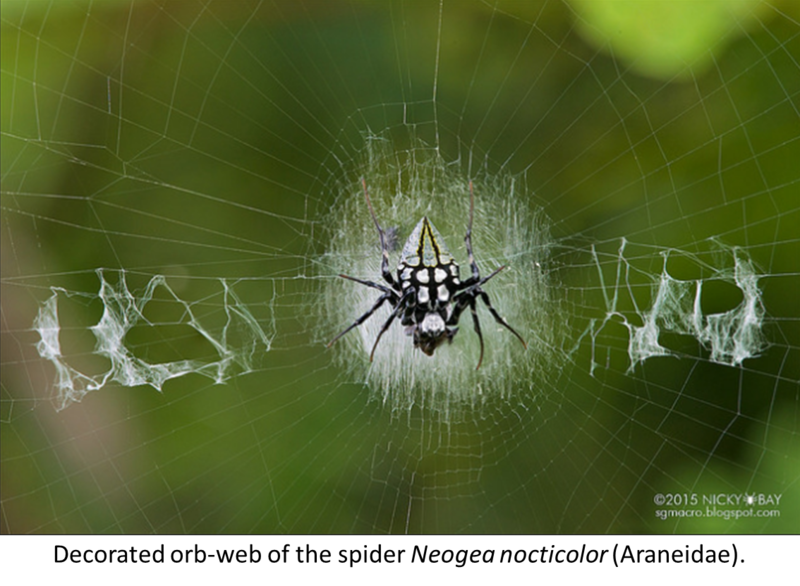 Many spiders decorate their webs with conspicuous UV-reflecting designs, what makes them bright for some insects and birds. 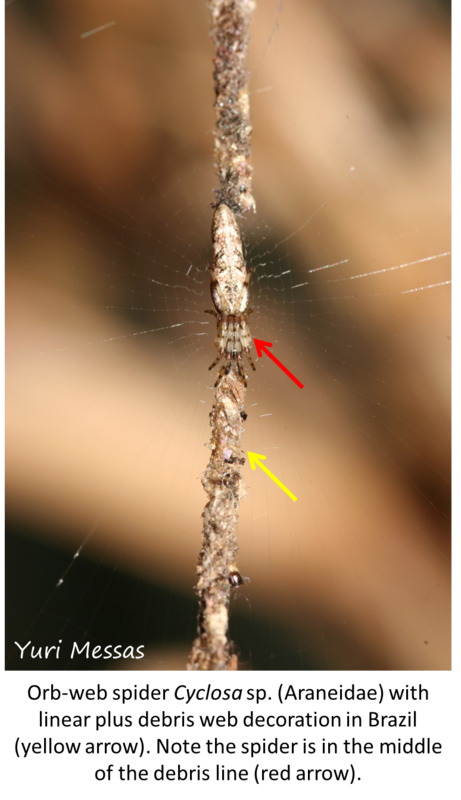 The function of these web decorations is controversial, with two main explanatory hypotheses: (1) increase in prey capture and (2) defense against predators.Our study aims to separate the role of these two explanations. Understanding foraging strategies of spiders is essential, as they are the most abundant predators in terrestrial ecosystems. Spider orb-webs should go unnoticed by prey. However, many spiders decorate their webs with conspicuous designs. Furthermore, many of the decorations reflect ultraviolet (UV) light, what makes them even brighter for some insects and birds. 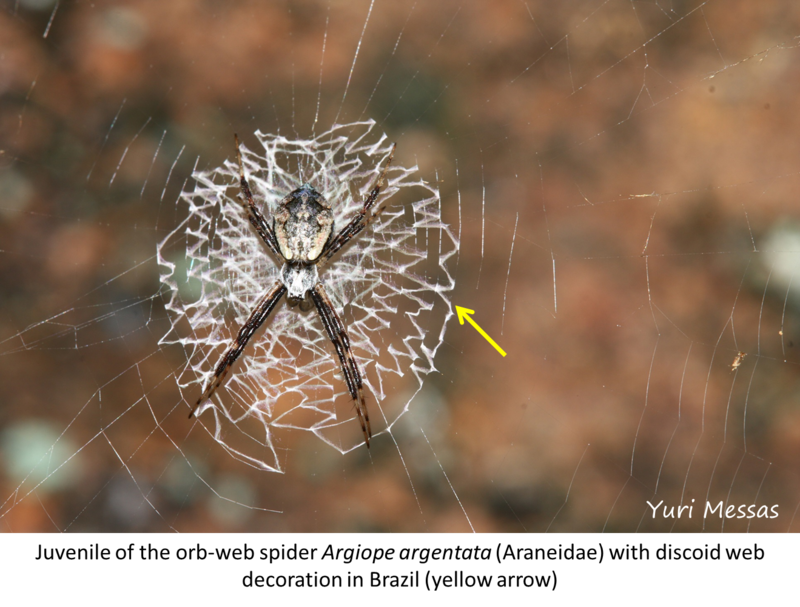 Although spider web decorations were described more than one century ago, there is still no consensus about its function. Some biologists point out decorations as a strategy to enhance prey capture, as insects are attracted to UV light. Other scientists support the hypothesis that decorations are indeed a defense against visually oriented predators, like birds. They argue that the decorations may conceal the spider body or make it look bigger than it is. There is even a Peruvian species that decorates its web with fake spider decoys. Spiders are the most ubiquitous and abundant predator on terrestrial ecosystems. It was estimated that spiders could consume about 42,490 kg/hectare of prey per year, which makes these arachnids important suppressors of insect populations. Indeed, the spider fauna can have a “buffer effect” on insects of agroecosystems. 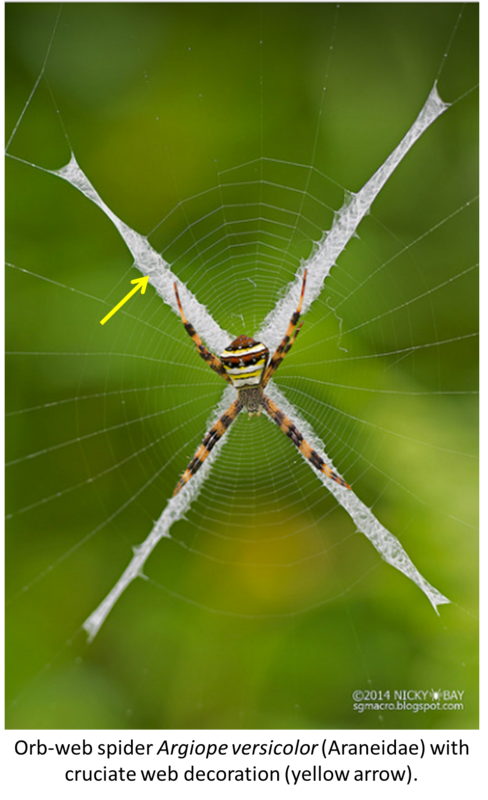 Furthermore, spiders that decorate their webs spiders may be foraging selectively for pollinating insects, as many flowers also have UV-reflecting markers to guide their insect partners. It was even developed devices with UV-reflective material as traps for controlling the approach of flying insects in cultivation facilities. Therefore, understanding foraging habits and strategies of spiders is an essential topic to comprehend how a plant-herbivorous-predator system works. (5) Try to separate the effect of web decoration on predator avoidance and on prey interception. For an ecologist, the field is a laboratory. Field work is essential to obtain data to conclude anything about how ecosystems work. However, the field is rather unpredictable, since we are subjected to weather conditions and animal/plant population fluctuations. Often we need to stay many days in field. Due to security issues, field trips should be done by at least two people. This justifies why the largest amount of the budget is due to the field expenses..
We plan to simulate orb-webs using sticky traps made of plastic and Tanglefoot. We will experimentally manipulate web decorations patterns by drawing different designs on the sticky traps with high UV-reflecting paints. The isolated UV-blocking factor of sunscreen can be used to exclude the paint UV-reflectivity. With this, we will evaluate the effect of different types of decorations on prey interception. We will also add to each sticky trap one artificial spider made of plasticine to evaluate bird attacks rates. This project addresses a fascinating question of nature and the team of experts in charge are more than able to answer it in the most clever way. This project can provide a big help to answer a controversial point of discussion about the role of stabilimenta in spiders. I am very confident that this project will give new perspectives to see how this incredible feature is important to these predators nowadays. Spiders make extraordinary decorations in their webs. This has fascinated scientists and nature lovers for decades. However, the function of this decoration is unclear. I'm really excited about this project, the researchers have formulated clear experiments to uncover the function of web decorations. These researchers are extremely competent and this project will generate very interesting results. I am really excited for this project. I believe it will answer interesting questions in this field of study. These researchers are extremely competent. 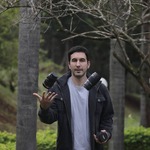 PhD in Ecology from the Universidade Federal de Uberlândia, Brazil. Since the age of 8 years old I wanted to study biology. This dream came true in the year of 2004, when I was approved in the exams of the State University of Campinas, in São Paulo, Brazil. There, I accomplished a Bachelor degree in Biology and carried out my first research, which was about inbreeding in social spiders. During my undergraduate time, I also carried out other smaller researches, such as the histological ontogeny of the lung from the fish Arapaima gigas and natural history of the colubrid snake Thamnodynastes nattereri. In the year of 2008 I started my master degree, when I researched about how plant architecture influences the community of spiders and insects. Now I am a Ph.D. student and my thesis focuses on population dynamics of social spiders (Anelosimus). For my Ph.D. research, I performed three years of field work in Serra do Japi, one of the rare remnants of inner Atlantic Forest in southeastern Brazil. I spent about five months per year in the field to obtain the data about populations of social spiders. Unfortunately, my research funding has already finished. However, I still want to continue my research projects on spider ecology. 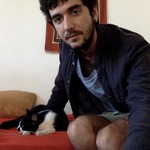 Diniz, S. (2011). Herpetology Notes, 4, 357-358. Diniz et al. (2012). Psyche: A Journal of Entomology, 2012. 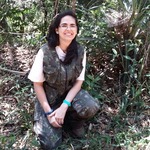 Vanessa Stefani: I am Ph.D. in Ecology from the Universidade Federal de Uberlândia, Brazil. At present, I'm postdoctoral research fellow in the same University. I have been studying ecology and behavior of spiders for ten years, including the courtship and mate behavior, natural history, and plant-spider interaction. I am currently conducting studies with the semi-aquatic spider Lycosa schenkeli (Lycosidae) and the interaction between floral secretions of nectaries and its associated spiders. Stefani et al. (2015). PloS one, 10(7), e0131843. Stefani & Del-Claro (2015). Journal of Natural History, 49 (3-4), 211-231. 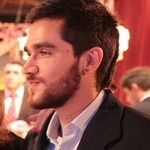 Rios et al. (2013). Bioscience Journal, 29(5). Stefani et al. (2012). Journal of Natural History, 46(33-34), 2117-2129. Stefani et al. Journal of Natural History, 45(17-18), 1119-1129. Moreira & Del-Claro (2011). Zoologia (Curitiba), 28(5), 565-570. Moreira & Del-Claro (2005). Neotropical Entomology, 34(6), 881-887. To answer our questions, we will be performing a manipulative experiment by using sticky traps as simulations of webs and plasticine models as simulations of the spider body. 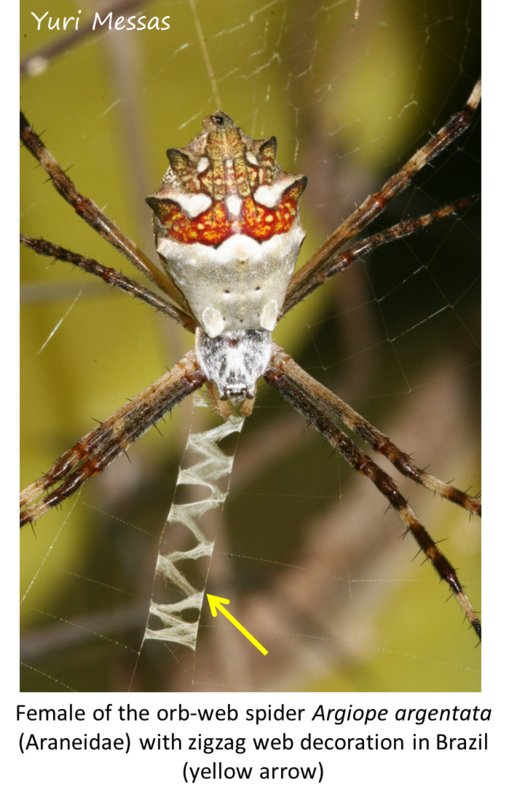 Although sticky traps are not real webs, these traps have already been used by other scientists to estimate prey availability for orb-web spiders. 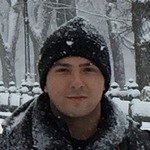 Despite criticism related to the differences between prey intercepted by traps and those actually captured by spiders, sticky traps can be useful indicators of the effect of web features, such as the decoration patterns, on prey capture, what could indicate selective pressures on the web design. 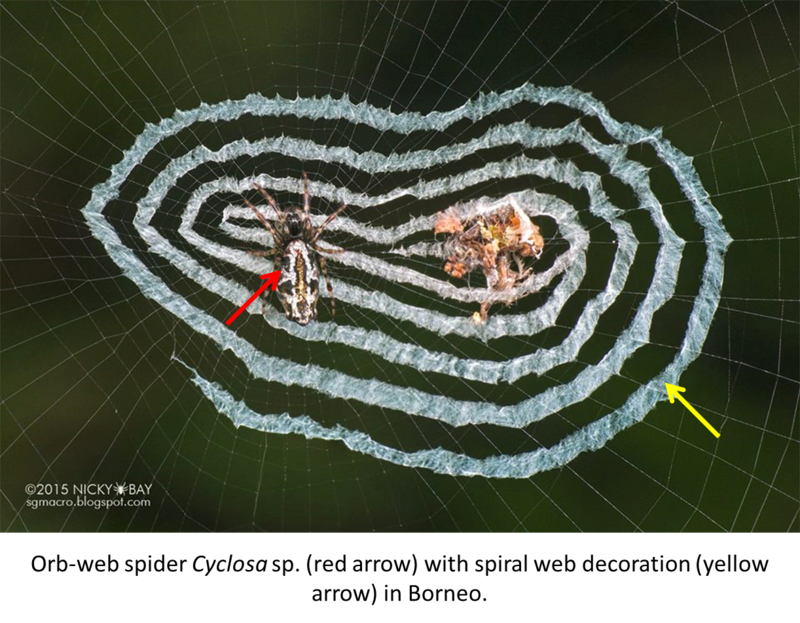 In our study, the use of sticky traps will enable us to freely manipulate decorative patterns drawn from real webs. We could, for example, change the design and size of the web decoration or exclude its UV-reflectance by applying the sunscreen blocking component. With this, we could evaluate the effects of each property (e.g., size, shape, UV-reflectance, positioning) of the web decoration separately. Plasticine clay models have become popular in experimental ecology. Usually, plasticine replicas of animals, such as larvae, frogs, and snakes, are placed in the field and examined for traits of physical attacks, like bites. Like any other field method, there are disadvantages of using plasticine models, as they lack the movement and the scent of real animals. However, in the specific case of our research ‒ in which we will place a plasticine model spider on the center of the sticky trap to replicate a spider on its web ‒ we don’t expect a significant bias of this technique, as orb-weaver spiders usually remains unmoving on the center of their webs waiting for prey and birds (one of the main predators of spiders) usually don’t rely on scent to locate food.